Research timelines are not just for publication--use them as part of your research process to organize and assess the mountain of information you have uncovered for your ancestor. Genealogy research timelines can help to examine our ancestor's life in historical perspective, uncover evidence inconsistencies, highlight holes in your research, sort two men of the same name, and organize the evidence necessary to build a solid case. A research timeline in its most basic form is a chronological list of events. However, a chronological listing of every event in your ancestor's life could go on for pages and become impractical for evidence evaluation purposes. Instead, research timelines or chronologies are most effective if used to answer a specific question. Most often such a question will pertain to whether evidence may or may not pertain to a particular research subject. When did my ancestor migrate to or from a particular location? Why might my ancestor have emigrated from Germany in 1854? Is there only one man of a particular name in a certain area and time period, or has my research (or others) erroneously combined information from two men of the same name? Was my ancestor married only once, or multiple times (especially when the first name is the same)? The items you might want to include in your timeline may vary based on your research goal. Typically, however, you might want to include the date of the event, a name/description of the event, the locality in which the event occurred, the age of the individual at the time of the event, and a citation to the source of your information. For most research purposes, a simple table or list in a word processor (e.g. Microsoft Word) or spreadsheet program (e.g. Microsoft Excel) works well for creating a research timeline. To get you started, Beth Foulk offers a free Excel-based timeline spreadsheet on her website, Genealogy Decoded. If you make heavy use of a particular genealogy database program, check and see if it offers a timeline feature. Popular software programs such as The Master Genealogist, Reunion, and RootsMagic include built in timeline charts and/or views. Genelines - Genelines timeline software includes seven customizable timeline charts and reads directly from Family Tree Maker versions 2007 and earlier, Personal Ancestral File (PAF), Legacy Family Tree, and Ancestral Quest. Genelines also supports GEDCOM import. XMind - This mind-mapping software offers a number of different ways to look at your data. For research timeline purposes, the Fishbone Chart can be helpful for showing the causes of a specific event, and the Matrix View offers an easy way to organize and represent chronological data. SIMILE Timeline Widget - This free, open-source web-based tool helps you to visually represent your timelines for easy online sharing with family or colleagues. The SIMILE widget supports easy scrolling, multiple time bands, and inclusion of photos, however you'll need to be able to work with and edit code (at a level similar to basic HTML website coding) to use this program. SIMILE also offers a Timeplot widget. See the Getting Started guide for more details. 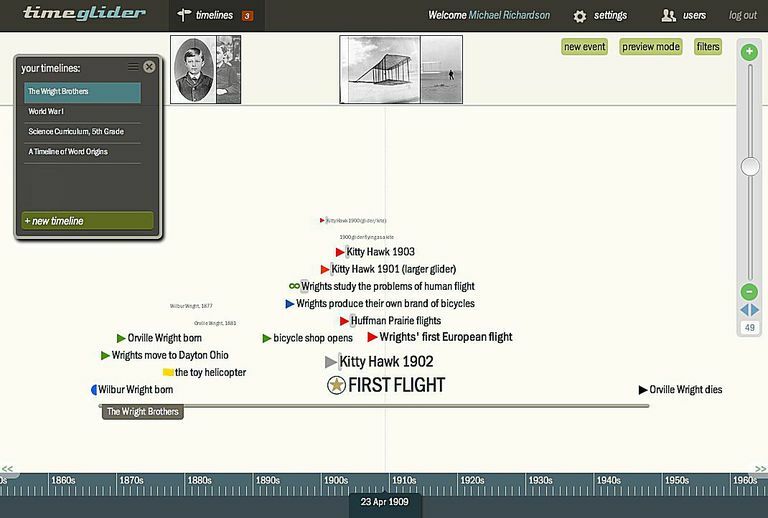 Time Glider - If you prefer a visual timeline solution that doesn't require a lot of technical skill, then this subscription, web-based timeline software makes it easy to create, collaborate on, and publish interactive timelines. A free plan is available (students only) for very simple timelines with limited photos. The regular $5 monthly plan offers extensive flexibility. Aeon Timeline - This Mac-based timeline software equips you with a variety of tools for creative and analytical thinking. It is designed for writers creating story plots, but the same tools for connecting people, places, and relationships with events is perfect for genealogical research. Want something even more creative? Valerie Craft shares a demonstration of using the free presentation software Prezi to create a visual genealogy timeline on her blog Begin with 'Craft'. Thomas W. Jones, "Organizing Meager Evidence to Reveal Lineages: An Irish Example—Geddes of Tyrone," National Genealogical Society Quarterly 89 (June 2001): 98–112. Thomas W. Jones, "Logic Reveals the Parents of Philip Pritchett of Virginia and Kentucky," National Genealogical Society Quarterly 97 (March 2009): 29–38. Thomas W. Jones, "Misleading Records Debunked: The Surprising Case of George Wellington Edison Jr.," National Genealogical Society Quarterly 100 (June 2012): 133–156. Marya C. Myers, "One Benjamin Tuell or Two in Late Eighteenth-Century Rhode Island? Manuscripts and a Timeline Provide the Answer," National Genealogical Society Quarterly 93 (March 2005): 25–37. Genealogy Case Studies: Learn from the Experts!